1768: born in Edo. His first name was Tôjirô. His father Tôsuke managed a float of garbage boats. 1790s: he become a disciple of Kasanui Sensuke I. Then he joined Sakurada Jisuke I. His first pen names were Sakae Hanji, Shimizu Hanji, Matsushima Yôsuke I and Matsushima Hanji I. 1796: Hanji worked at the Kawarasakiza. 11th lunar month of 1797: Hanji worked at the Nakamuraza to assist his master Sakurada Jisuke I on the kaomise drama "Kaikei Kokyô no Nishikigi", which celebrated the shûmei of Arashi Shichigorô III. 11th lunar month of 1799: Hanji worked at the Ichimuraza, to assist Katsu Hyôzô I, Chikamatsu Monkyô and Matsui Kôzô I, on the kaomise drama "Utsukushiki Yuki no Sekai", which celebrated the shûmei of Ogino Izaburô II. 11th lunar month of 1802: Hanji worked at the Nakamuraza to assist his master Sakurada Jisuke I on the kaomise drama "Koshiji no Hana Oedo no Torideki". 11th lunar month of 1804: Hanji worked at the Nakamuraza to assist his master Sakurada Jisuke I, along with the sakusha Nagawa Shimesuke I and Fukumori Kyûsuke I, on the kaomise drama "Kiku Zumô Mikurai Sadame", which celebrated the shûmei of Iwai Hanshirô V, Ichikawa Yaozô IV and Nakayama Bunshichi III, and welcomed in Edo the actors Segawa Rokô III and his adopted son Segawa Kamesaburô. 11th lunar month of 1805: Hanji worked at the Nakamuraza to assist Nagawa Shimesuke I and Tsuruya Nanboku IV on the kaomise drama "Seiwa Genji Nidai no Yumitori", which welcomed in Edo the actor Ôtani Tomoemon II. 1807: he took the name of Tagawa Shôsaku. 11th lunar month of 1808: he took the name of Sakurada Jisuke II and became tatesakusha at the Moritaza, working with Fukumori Kyûsuke I on the kaomise drama "Hana to Mitsu Yuki no Kusunoki". Premiere at the Moritaza of the 7-role hengemono "Yamato Gana Iro no Nana Moji"; all the lyrics were written by the new Jisuke and all the roles were performed by Bandô Mitsugorô III. The seven dances were "Kanjo" (the court lady), "Saru Mawashi" (le dresseur of singes), "Inaka Musume" (a country girl), "Sotoba Komachi", "Genta" , "Momotarô" and "Sanbasô". 1st lunar month of 1810: premiere at the Ichimuraza of Tsuruya Nanboku IV's drama "Kokoro no Nazo Toketa Iroito"; Jisuke was one of the main collaborators in the sakusha team [casting]. 5th lunar month of 1810: premiere at the Ichimuraza of Tsuruya Nanboku IV's drama "Ehon Gappô-ga-Tsuji"; Jisuke was one of the main collaborators in the sakusha team [casting]. 9th lunar month of 1810: premiere at the Ichimuraza of a 3-role hengemono, which was entitled "Mata Atarashiku Mitsu no Sakazuki" ; the roles were all played by Bandô Mitsugorô III and all the lyrics were written by Jisuke. 3rd lunar month of 1811: premiere at the Ichimuraza of Jisuke's 7-role Tokiwazu-based hengemono "Shichimai Tsuzuki Hana no Sugatae" , a dance program made up of seven dances with all the roles played by Bandô Mitsugorô III: "Nyo San no Miya", "Kajiwara Genta", "Shiokumi"  (the salt-making girl), "Sarumawashi" (a monkey showman), "Gannin Bôzu"  (a bonze), "Rôjo" (an old woman) and "Kan U" (a Chinese warlord). 9th lunar month of 1812: the actor Nakamura Utaemon III, who was about to travel back to his native Kamigata after more than 4 years spent in Edo, performed his onagori kyôgen at the Nakamuraza, which included the premiere of a sanbasô, which was written by Jisuke and entitled "Mata Kuru Haru Suzuna no Tanemaki". The roles of Sanbasô, Senzai and Okina were played by Nakamura Utaemon III, Nakamura Akashi IV and Nakamura Shichisaburô IV. 6th lunar month of 1813: premiere at the Moritaza of the 8-role hengemono "Mata Koko-ni Sugata Hakkei" ; the 8 roles were performed by Ichikawa Danjûrô VII. All the lyrics were written by Jisuke. 4th lunar month of 1818: premiere at the Nakamuraza of Jisuke's Tokiwazu-based dance-drama "Sono Sugata Hana no Utsushie", commonly called "Mitsu Ningyô" (literally "The Three Puppets") [casting]. 11th lunar month of 1818: Jisuke worked, along with Namiki Gohei II (who celebrated his shûmei), Tsuchii Hyôshichi I, Tajima Konosuke I and Matsushima Hanji II (who celebrated his shûmei), on the kaomise drama "Ise Heiji Hiiki no Kamikaze". 9th lunar month of 1819: the actor Nakamura Shikan I, who was about to travel back to his native Kamigata, performed his onagori kyôgen at the Nakamuraza, which included a spectacular 9-role hengemono which was written by Jisuke and entitled "Onagori Oshie no Mazebari" . 9th lunar month of 1820: premiere at the Nakamuraza of a 7-role hengemono, which was entitled "Setsugekka Nagori no Bundai" ; the roles were all played by Bandô Mitsugorô III and all the lyrics were written by Jisuke. This was Bandô Mitsugorô III's onagori kyôgen, as he was about to depart from Edo to perform in Ôsaka. 6th lunar month of 1826: premiere at the Ichimuraza of a 3-role Kiyomoto-based hengemono, which was entitled "Mata Koko-ni Kabuki no Hanadashi"  and starred Bandô Mitsugorô III; all the lyrics were written by Jisuke. The 3 roles were Take-no-Uchi no Sukeneya (a legendary character famous for his extraordinary long life), a fisherman fighting a giant octopus and a tekomai festival dancer . 11th lunar month of 1826: Jisuke worked at the Ichimuraza to assist the tatesakusha Nakamura Jûsuke IV, along with Nagawa Motosuke and Mimasuya Nisôji, on the kaomise drama "Ise Heiji Shô no Kaomise". End of 1826 or beginning of 1827: he took the name of Matsushima Chôfu I. 11th lunar month of 1827: the kaomise drama "Kawaranu Hana Genji no Kaomise", which was written by Chôfu, Mimasuya Nisôji and Kanai Sangyô, was staged at the Ichimuraza; it starred Bandô Mitsugorô III, Ichikawa Danjûrô VII, Ichimura Uzaemon XII, Bandô Minosuke II, Ichikawa Ichizô II, Iwai Kumesaburô II, Iwai Shijaku I, Osagawa Tsuneyo IV, Nakayama Bungorô II, Sawamura Shabaku, Ogino Izaburô III, Naritaya Sôbê and Bandô Tamasaburô I. 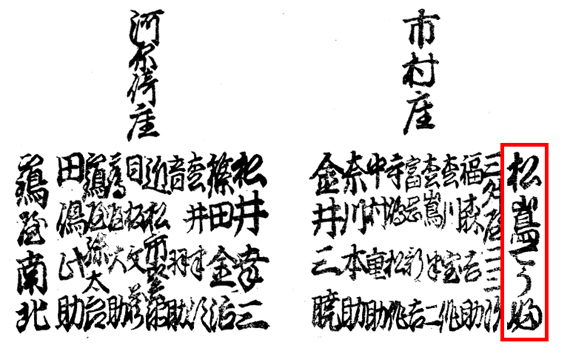 11th lunar month of 1828: Chôfu worked at the Ichimuraza, along with Nakamura Jûsuke IV, Matsukawa Hôsaku and Nagawa Motosuke, on the kaomise drama "Mitsugi no Yuki Genji Hiiki". 21st day of the 3rd lunar month of 1829: a fire broke out from the shop of Owariya Tokuemon, in the district of Kanda Sakuma-chô. It spread and destroyed the Edo theaters district; Chôfu was deeply wounded. He tried to recover at his disciple Matsushima Yôsuke III's home in the district of Ichigaya Motomura-chô where he died the 14th day of the 4th lunar month of 1829 . Matsushima Chôfu I was an important Edo sakusha, who worked on more than 150 original dramas (including at least 30 dance-dramas). He wrote a lot for the Edo star (and outstanding dancer) Bandô Mitsugorô III. Some of his dances are still in the current Kabuki repertoire: "Amiuchi", "Asazuma Bune", "Genta", "Kairaishi", "Makasho", "Omatsuri", "Ômi no Okane", "Shiokumi", "Shitadashi Sanbasô", "Tama Usagi", "Tobae" and "Ukare Bôzu". He had two important masters, Sakurada Jisuke I and Tsuruya Nanboku IV. His shosagoto were influenced by the former and his dramas by the latter. At the beginning of his career, he was nicknamed Gomihan, han for Hanji and gomi which means garbage as he was the son of a businessman specialized in garbage collection. The 14th day of the 4th lunar month of the 12th year of the Bunsei era was the 16th of May 1829 in the western calendar. "Genta" is still in the current Kabuki repertoire. One of these roles, the street performer, is still part of the current Kabuki repertoire ("Kairaishi"). The dances "Gannin Bôzu" and "Shiokumi" are still part of the current repertoire; the former was staged under the title "Ukare Bôzu". One of them, the one for the view "wild goose swooping down upon Katata in Autumn" ("Katata no Rakugan" in Japanese), has survived and became an independent popular dance item in the Kabuki repertoire, known under the titles of "Ômi no Okane", "Danjûrô Musume" (the Danjûrô Girl) or "Sarashima" (the Cloth-bleaching Girl). One of these roles was still in the current Kabuki repertoire ("Tobae"). Three of these seven roles are still part of the current Kabuki repertoire: "Asazuma Bune", "Makasho" and "Tama Usagi". The fisherman and the dancer are nowadays independent dances, which are staged under the respective titles of "Amiuchi" and "Omatsuri". Bandô Mitsugorô X revived the 3-role dance "Mata Koko-ni Kabuki no Hanadashi" in October 2003 at the Minamiza.